Malaga’s ante has been upped yet again. The list of things to see and do in this stunning city seems to get longer year on year, to such an extent that one really has no excuses to fly into Malaga and not stay for at least a couple of nights. One of our newest cultural, historical – and spiritual! – additions is the glorious Hammam Al Ándalus. Having opened its doors in May 2013 after 10 years of painstaking restoration and creation, the result is one more reason to add this experience to your “to do” list when in town. Al-Ándalus refers to the territory of the Iberian Peninsula that was occupied by the Moors from 711 to 1492. The word hammam is an Arabic word meaning ‘spreader of warmth’. The ritual goes back thousands of years to the Romans and Greeks who developed the communal bath as a social institution. 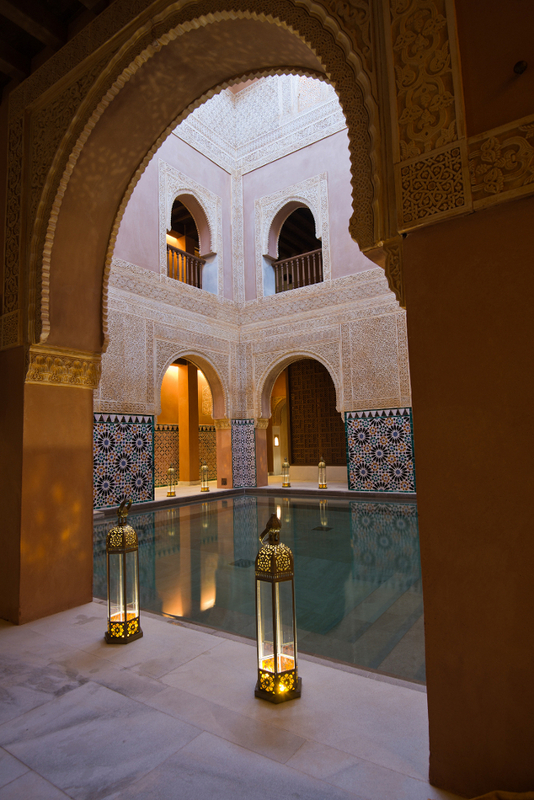 The Islamic baths in their origins only comprised of cold water baths to which only men were permitted access. It wasn’t until around 600AD when the Prophet Muhammad realized that hot baths could promote fertility, that women began to partake in this hygienic and social ritual around which Muslim life soon became centred. Tucked down a little side street in the old “Medina” of Malaga’s city centre, from the street it is hard to believe that these two small doors actually give way to 1300 square metres of grandeur in which to relax, revitalize and be pampered. As I step inside, the scent of jasmine, soothing lighting, stunning architecture, gentle Arabic music and a warm welcome from the staff seem to stop time then and there. My imaginary relax button is now turned to “on” and my “journey of the senses” immediately begins, back to the by-gone era of Al Ándalus. Something is already telling me I could get very used to this. I am given a pair of booties to cover my shoes (just to get me to the dressing room, after which it is barefoot all the way – do not despair, the under floor heating throughout the Hammam is heavenly and all part of the experience, and for anyone wanting to cover up their tender tootsies, latex socks can be purchased for a Euro). I make my way down the staircase, pick up a fouta towel (foutas are traditional cotton towels used in Hammams) at the entrance to the dressing rooms, and in I go to the Ladies. Wow. If this is what the dressing room looks like, I can only imagine what’s next. This is like the amuse-bouche at a very good restaurant – a taste of what is to come. From the hand-forged copper sinks to the tadelakt walls and everything in between, no expense has been spared in generating a warm and relaxing effect. All one needs to bring is a swimsuit – towels and shampoo/gel are provided and yes ladies, there are even hair dryers! I exit the dressing room into a corridor where Miguel, one of the masseurs, waits to show me and four other visitors (two men, two women) into the Hammam; his calm and demure manner adds to the serenity of the place. The gentle Arabic music is now accompanied by the sound of trickling water. Heavenly. 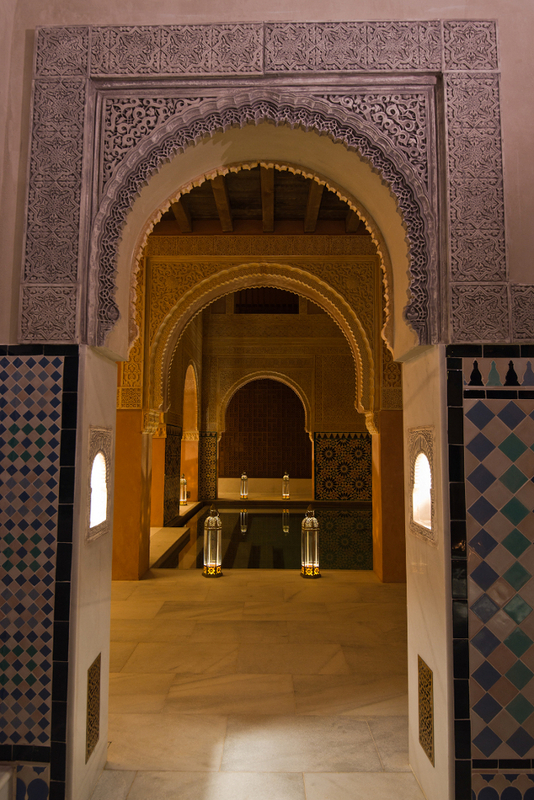 We pass by the cold baths and into the “heart” of the Hammam, where the warm bath takes centre stage in the covered “courtyard” surrounded by keyhole archways and walls of engraved stone and hand-painted ceramic tiles (the latter are done in the colours of Andalucia no less). Candles and lanterns, which no Hammam can be without, are not amiss. Miguel explains the layout of the various rooms and the “order ritual” that using a Hammam entails. First it’s up to the 1st floor for a cool shower, after which it is recommended we start with the warm baths (there is a second warm bath next to the shower area), then the hot bath under the beautiful “starry” cupola (adjacent to which is a room with heated stone slabs to lie on for deeper relaxation). Next comes a few minutes in the hot steam room, and finally, for the full revitalizing effect, the cold baths. On top of it all, everything is eco-friendly – the baths are chlorine-free, and a highly sophisticated geothermal energy system is used to maintain the temperature of the Hammam and its baths. After some time in the warm room, the hot room (divine) and steam room, although not for a lack of trying, I chicken out at my first attempt to get into one of the cold baths. Back to the hot room I go. As I am lying on a sublimely warm stone slab feeling the stress leaving my body and thinking it couldn’t get any better than this, Miguel discretely appeared to tell me it was time for my massage. It does get better! He lead me up to the massage area on the 1st floor where there are about 10 massage tables dotted around the periphery of the spacious room (a few of which are in little alcoves). Miguel introduces me to my masseuse, and off he goes again. Feeling a bit chilly due to having just left my warm haven, imagine my surprise when I lay down on the stone massage table only to find that it too is heated! It really doesn’t get better than this. The Hammam offers a few different treatment packages, and I had the “Al Andalus Ritual and Bath” which comprises of a 15 minute traditional Kessa treatment, followed by 15 minutes relaxing massage. Prior to the massage, from the “Aroma Corner” I selected lavender essence for my treatment. The Kessa treatment consists of first having warm water slowly poured (from a height) all over your body (wow), then a Kessa glove is used to lather and scrub the body with a red grape soap, exfoliating the skin and stimulating blood circulation. Then come the bubbles. Filling a cloth sack reminiscent of a pillow case with water and scented soap, she blows into it to create a huge cloud of bubbles which are then lightly squeezed out of the sack and onto my body. The surprise sensation of thousands of tiny little bubbles bursting on my skin was, in a word, delightful. And now for the relaxing “lavender” massage. After confessing that I have very ticklish legs, the masseuse focused on my back and neck. She found all the “hot spots” where I have issues (without me having to tell her where) and paid extra attention to these areas which, to me, is always the sign of a good masseur. The massage sadly comes to an end, my masseuse hands me a little organza bag holding the Kessa glove and exfoliating soap to take home with me, and feeling like I just woke up after a long siesta, I go to the “Tea Corner” and pour myself a hot cup of hot mint tea. Then another…I couldn’t resist, it was that soothing. I have about a half hour left of my hour and-a-half session which I spend in the baths – warm, hot, steam….and into the cold I go! The invigourating sensation has me giggling at myself for being such a wuss on the first attempt. Loving it so much I nip back to the hot steam room for a few minutes and return to the cold bath just to feel that rush all over again. Perfect timing too – just as I re-immerse myself completely, a bell rings and it’s time to go. Boo hoo! 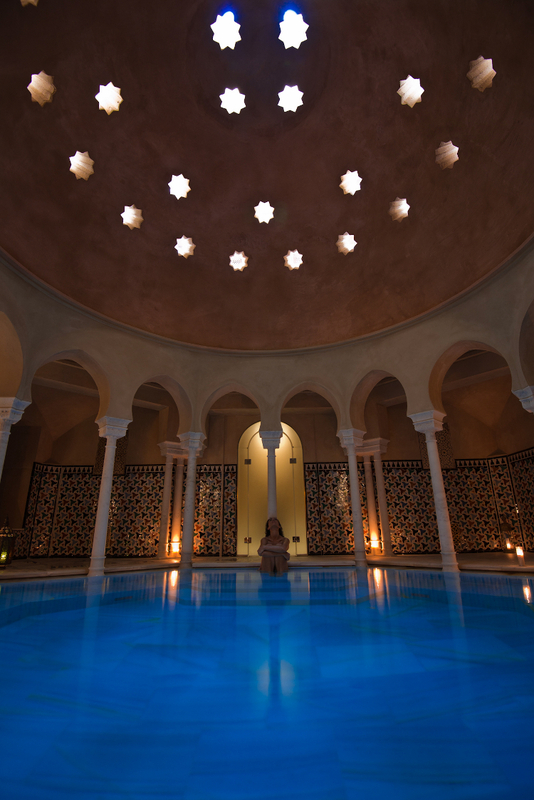 I left the Hammam Al Andalus feeling invigourated, rejuvenated and at the same time deeply relaxed. Needless to say I slept like a baby that night. Highly recommended for a taste of by-gone times in Andalucia. You are welcome Marianne, it is indeed divine!! A truly beautiful place and yet another fantastic addition to the beautiful city. Many thanks Steve – always amazes us how people can review places they have obviously never set foot in! Yes, it was I who was asking about Spa treatments. Having read your description of your own experience at the Hammam in Malaga, which I have already stumbled across and found closed due to a water problem, I am sold. This will be my friends birthday treat. Thank you. Do I need to book? Hi Joy – definitely need to book as you can then choose the 90 minute slot you want. Click on the link on their name at the bottom of the post to take you to their website (page is in English too) Various “regimens” available and you can book on line. Don’t get it confused with the old Arab Baths (which have been closed often due to water problems I understand). indeed, it does sound divine! love the photos too. A fantastic addition to Malaga´s numerous attractions Tobyo! Wow! Great post. Yet another reason to visit Málaga. Hi Hayley, I have just sent you an email with some further information. Thanks! 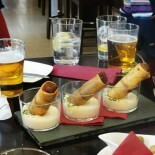 This entry was posted on December 14, 2013 by Tapas in Malaga in Málaga and tagged Hammam, Málaga, Spa.